We are manufacturer of Refrigeration Compressor Parts for Voltas, S.M.C, Accel Sabro, Kirlosker, Trane Model Cylinder Liner & Piston. We are manufacturer of Air Compressor Parts for KG Khosla, Atlas Copco, Ingersoll Rand & Holman. We are also manufacturer of Refrigeration Compressor Parts for Voltas, S.M.C, Accel Sabro, Kirlosker, Trane Model Cylinder Liner & Piston. - Air conditioning compressors of Frick, Super, Sinco, Kirloskar etc. Refrigeration Compressor Kit are highly graded and eminent serving products of our company given out at a very true and genuine market rate. Being one of the renowned firms in the industry, we are decidedly involved in providing a high-quality array of Crankshaft Bearing Set. We manufacture refrigeration compressor spares which is basically used for compressors. We are one of the reputed organization involve in providing superior quality Refrigeration Compressor Spare Parts. 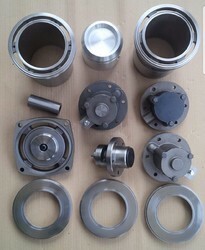 These Refrigeration Compressor Spare Parts are made from high quality of raw material which ensure durability at its user end. We offer GODREJ PUF Refrigerator Crank Shafts. manufactured by us are superior in quality and offer many advantages over conventional equipment. These are available in superiorproducts. We offer them in, grey iron, SG iron as per customer requirements. We offer Compressor Spare Parts For Air & Refrigeration. Our range includes replacement spare parts for : grasso / kirloskar / voltas / bitzer / sabroe / carrier / copeland / york / blue star / trane / vilter / stal / mycom / frick / elgi / ingersol rand / atlas copco etc. This range of compressors reduces the volume of gas or liquid by sweeping it. These compressors reciprocate and Rota tune compressors at minimum and maximum speed. The screw inside the compressors compress the gas at a speed of 50 to 60 Hz which make the entire compression process faster and efficient.